7 Blogger Template Edits to make your blog more seo friendly. Remove post atom, wrench icon, blogger Attribution gadget and navbar . We knows blogger templates are lighter and easier to customize. We all have seen how beautiful are bloggers blog but still there are some useless codes present in Blogger's template. To make your blog faster to load , we need to make it more and more lighter by eliminating those parts which are not necessary in blogs like bloggers wrench button , powered by blogger Attribution widget, subscribe to post atom and navbar. Deleting these elements from your blog will make your template lighter and the calls to resources will become less. As a website owner you should focus on its speed because a majority of people's closes websites taking more than 3 seconds to load. So it becomes necessary to reduce your page load time. You can check your page load time at tools.pingdom.com for free. Today you will learn how to remove unnecessary codes from your blogger template. Bonus tip: Compress your your entire blogger template with https://htmlcompressor.com/compressor/ and reduce your template size to 70%. 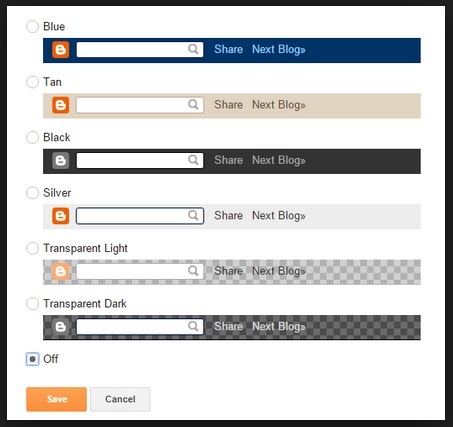 Let's see how to customize Blogger's template in easy way. 1. 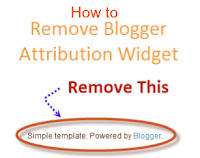 How To Remove Blogger Attribution Gadget easily by editing your template. The Attribution gadget is a gadget which is present in your footer section saying " Powered by Blogger". When you try to remove this you will note this this gadget is locked by default. So if you want to remove powered by blogger Attribution widget then you need to unlock this widget by using your template editor. Follow these simple steps to unlock your Attribution widget. Step 1. Go to blogger.com then login and head over to your blog. Step 2. Now go to Template > HTML . Step 3. Click anywhere inside your editor and press CTRL+ F to open search box. Step 4. Copy below code and paste it on above mentioned search box and hit enter </head> . Step 5. Now it's time to add some CSS code to remove blogger Attribution widget. Step 6. Last step is to save the changes we have done in above step. Just click on save template and wait for the changes to be saved. That's all check your blog now. 2. Remove the navbar to make your Blog more SEO Friendly. 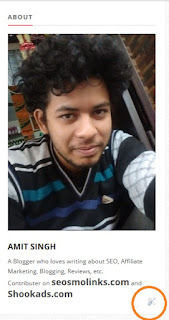 I am not a big fan of this blogger navbar. These days this widget have no use. It also makes your blog looks similar to other blogger blogs. There is a next blog button present which divert your reader to next available blog. It's not good for seo to have Blogger's navbar on your blog because you will loose your precious readers + the links on navbar to next blog are dofollow. So it is always better to be on save side. So to remove it follow some steps below. Step 1. Visit dashboard > layout . Step 2. Click edit on navbar and a popup window will open. Step 3. Click on turn off the Navbar and your navbar will remove. 3. how to remove subscribe to posts (atom) using template editor. Step 1. Visit Dashboard > Template > Edit HTML. Step 2. Click on your template editor box and open Blogger's search box by pressing Ctrl+ F.
Step 3. Copy below lines and find it on your template. Step 4. Just delete them from your template and save all the changes. Now subscribe to: posts (atom) link will be removed from your blog. 4. How to remove wrench icon/quick edit pencil in Blogger's blog. When you open a blogspot blog you will find a editing tool or quick edit pencil on different widgets. These widgets are unnecessarily present in your blog. To make your template even more lighter you should remove this utility from your Blogger's blog. Follow some simple steps to remove this. Step 1. Open your Blogger's dashboard > Template > Edit HTML . Step 2. Paste below code before </ b: skin> . Step 3. Click “ Save ” on your template. About us and Contact page doesn't require comments necessarily so it's good idea to remove them from these pages. To disable comments visit pages, edit page and disallow readers comments present in right sidebar. There are some changes to do in blogspot blog for max seo. And one of them is changing heading tags in post titles. By default post titles are H3 which have low seo precedence then H1 tags so we will change them to H1 using template editors. Find < h3 class= ' post- title' > and change < h3 > to < h1> . See below example for correct changes. Save all changes and you are done. Just few months ago Google launched mobile friendly seo update in which those websites which are not mobile friendly will loose rankings on mobile devices. So here you will make your blogger website mobile friendly with some below steps. Step 1. Open Dashboard > Template. Step 2. Click the setting icon for the mobile template. Step 3. Now select “Yes. 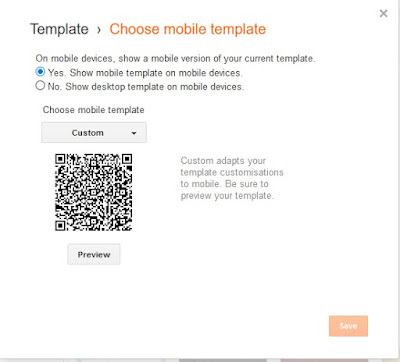 Show mobile template on mobile devices.” and choose your theme!or leave it default. Step 4. Click the save button. I hope you have enjoyed this tutorial very much so please comment here with your reviews and also let me know is there any more seo trick and tips for blogger. Nice edits for beginners, but I really doubt if they help in making one's blog more SEO friendly. Naman know anything about seo? i think you dont know much about seo. These tricks are only for seo purposes and you will find these changes already done by highly optimized seo templates. I don't think that removing nav bar and attribution makes blog more SEO friendly. It's for giving blog a professional look. I am very happy to read your search engine optimization related post.Because it is very helpful post for me.I think it is very valuable information for search engine optimization. So please keep writing for us. i want to make a cerrer in seo....how to i learn? Hi Admin, thanks for sharing awesome seo friendly website template. I think of using one for my new Digital Marketing Training site. I always thought that keeping the navigation bar will make the website more user friendly but it seems i was wrong. Thanks for sharing, there's always have something to learn from the SEO Expert like you.